The queen of all culinary herbs. The thin pointed anise flavored leaves are the magical ingredient in ‘béarnaise’ and ‘tartare’ sauces. Requires well drained composted soil. Dies down in winter. Replace every four years. Perennial. H:90cm W:90cm. 12cm, 17cm. 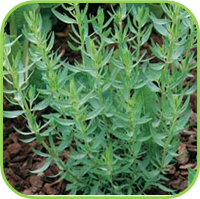 • Replant French Tarragon every few years as plants lose their vigour over time. 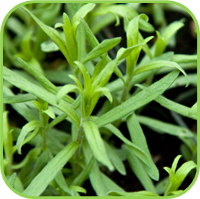 • The variety grown from seed is Russian Tarragon and is much more bitter, lacks the aromatic oils of the French variety and not recommended. • Vegetables: Plant with Eggplant. 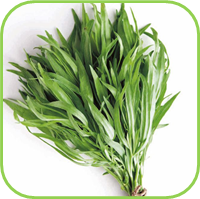 • One of the classic French fines herbes used to enhance the flavours of a variety of foods, use with French dishes. • Strong uplifting aroma, use some in bathwater. • Rich in iodine, mineral salts, vitamins A and C.
• A cup with meals.